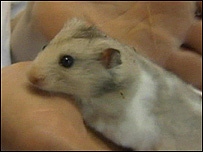 Two Cambridge University students who sent a hamster through the post for a joke have been fined. 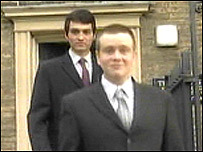 David Jordan and James Cole, both 19 and Churchill College students, carried out the prank after getting drunk at a party, Ely magistrates heard. Jordan, of Ely in Cambs, and Cole, of Marchwood, Southampton, both admitted abandoning a hamster in circumstances likely to cause suffering. In court on Tuesday, Jordan was fined £750 and Cole fined £500. The court heard that Jordan provided a false name and address when he bought the hamster at a pet store in Cambridge on 22 June last year and Cole lent him the money. 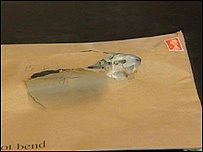 The hamster was discovered by postman Robert Maher as he was emptying a post box in Market Square in the city. It had chewed through the envelope and its head was peeping out. Mr Maher took the hamster to a vet where it was found to be unharmed. In a statement, vet Jillian Pearson told the court the animal had no access to food or water and it could have been crushed. An investigation by the police and RSPCA led to Jordan and Cole. Jordan told an RSPCA officer he had carried out the prank in revenge on a man with whom he had had an argument. He said the pair had been "plastered" after attending a party. Christina Metcalfe, mitigating for Jordan, said: "These two young men are clearly very intelligent and have made a very foolish and stupid error." Hamish Ross, chairman of the bench, said the court believed the incident had been premeditated. He said Cole could have prevented the prank but instead had let himself and his "college down". In court, both men were also banned from keeping animals for the next 10 years and each ordered to pay £100 in court costs.